progeCAD is a low-cost CAD alternative for creating, editing and plotting native AutoCAD DWG files without buying AutoCAD or AutoCAD LT. Since the release of progeCAD 2013, every installation is accompanied with a toolbox called progeCAD Center. progeCAD center is also available for use during the free trial period of the software. 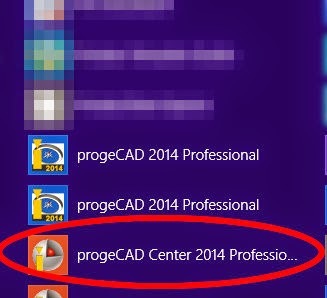 progeCAD Center can be started from the START menu icon within the progeCAD Start Folder, or from the icon on the Desktop menu in Windows 8.1 (shown right). Once started, there are several categories which appear in the toolbox. For progeCAD 2014 these are: Launch progeCAD, Register progeCAD, Online Support, Help / Video, Settings, Utility, Support Tools. We will review each of these as used in progeCAD 2014 professional. Launch progeCAD: This CLOSES progeCAD Center and starts the progeCAD Software program. Register progeCAD: When you buy a progeCAD license or install a new progeCAD Network client, use this option to activate the license code. Online Support: A webpage to the contact us page for support questions is opened. progeCAD Center remains active. Help / Video: Launches the progeCAD Searchable Help files, either for users or programmers. Video Tutorials open a webpage with a list of online video lessons for CAD beginners. Settings: Turn graphics acceleration on or off (recommend ON), Repair (use this first if progeCAD stops running as a result of the user environment somehow becoming corrupt), Toggle Automatic Updates On or OFF (recommend ON), User support folder - direct access to progeCAD support files for templates, hatches etc. 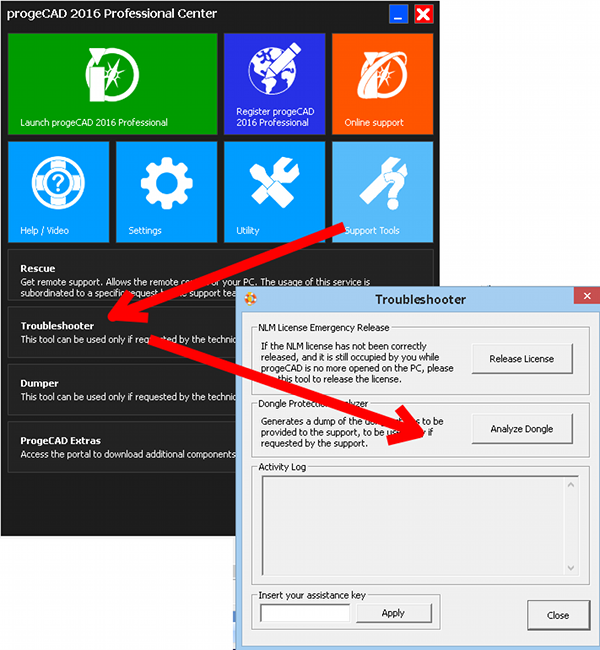 Support Tools: Rescue, Troubleshooter and Dumper are all functions used when in contact with the progeCAD development team for remote access and analysis of problems that a user may be having specific to their installation of progeCAD. progeCAD Extras opens a webpage with a few extra downloads, including the VBA toolkit for progeCAD 2013 and 2014, as well as updated USB dongle drivers for mobile USB licenses. 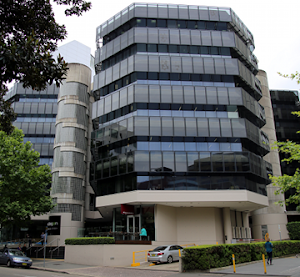 For more information about progeCAD as a low-cost AutoCAD solution, contact CADDIT or visit the website HERE.